From Mike Garafolo and Lindsay H. Jones's "Manti Te'o among players to be grilled at NFL combine"
Excerpt: Former Green Bay Packers executive Andrew Brandt knew the players had been prepped for the combine interviews for weeks, so he would try throwing them off. "What do you do when you get up in the morning?" he'd ask. Brandt would keep drilling the players with those seemingly inane questions until he found out whether the young man in front of him was dedicated and hard-working. 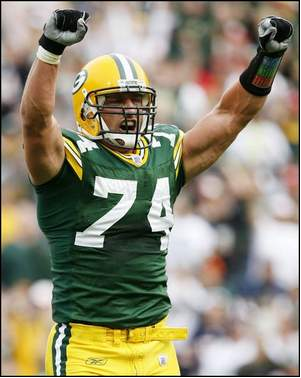 "I was looking for the guys that did a hundred pushups before they brushed their teeth, the guys that woke up early for that last study before class," said Brandt, who cited former Packers all-pro defensive end Aaron Kampman as an example. There are few job interviews as intense as NFL scouting combine interviews. Manti Te'o, Tyrann Mathieu and others with red flags are about to learn they're not exactly walking into a corporate board room. Torrey Smith found that out in Indianapolis two years ago. "Somebody asked me if they hit me, what would I do?" said the Baltimore Ravens wide receiver, who declined to reveal which team posed the unusual question. "I said, 'No disrespect, but I'll hit you right back.'" Smith's answer had the questioner and his colleagues laughing. Consider that acing the interview because those 15-minute sessions are quick, fast-paced and ruthless. Te'o's "catfishing" situation, Mathieu's dismissal from the Louisiana State team because of repeat failed drug tests and Georgia linebacker Alec Ogletree's DUI arrest last week will lead to some interesting sit-downs that can be more like interrogations than interviews. Teams are permitted to conduct up to 60 of these formal interviews. They last 15 minutes before the players rotate — not enough time to truly get a feel for a player's personality. The window is also small enough for a player to put on a ruse. "Maurice Clarett," former Denver Broncos general manager Ted Sundquist said of the team's third-round pick in 2005. "I know he didn't act intelligently (during his brief NFL career), but he's a very intelligent, very engaging guy. When he came to the combine, he was not prepared physically, but he presented himself in a manner that we felt like he was ready (mentally). ... He wasn't ready." Sundquist recalls a lot of "Yes, sir" and "No, sir" answers that "were very pointed toward him being a competitor." Clarett told the Broncos' staff, "All I want is my opportunity." The Broncos gave it to him by using a compensatory third-round pick on him. They were confident in their ability to spot talented running backs and believed Clarett was prepared to reinvent his character. They were wrong. When Clarett showed up to training camp, he was overweight and undermotivated. He was cut by the end of the preseason. Which is why these sessions can be particularly harsher than most people experience. If there are issues to be uncovered, teams will use interesting techniques to find them. Former Green Bay Packers executive Andrew Brandt knew the players had been prepped for the combine interviews for weeks, so he would try throwing them off. With a laugh, Brandt added, "At some point the coaches and general manager kicked me out, 'Hey, you're taking too much time with your games you play.'" There are often quicker, more aggressive "games" played, like the one the Ravens' Smith faced. Brandon Meriweather, a first-round pick of the New England Patriots in 2007, also diffused a similar situation. Meriweather hadn't even completed the act of sitting down in his chair for a meeting with a team when the University of Miami safety heard the first question about his role in an on-field melee the previous season. "What the (expletive) were you thinking?" The technique was designed to see if Meriweather's temper would kick in. It didn't, and Meriweather said the tenor of the rest of the interview was a much more professional one. Sometimes, the intimidation factor comes in the form of a large interview panel, which can often include a team psychologist. "I wondered, what can this doctor tell you about an NFL player?" said Ricky Jean Francois, the San Francisco defensive tackle drafted in the seventh round in 2009. Francois recalled a particularly intense 15-minute session with the Cleveland Browns, who had his Louisiana State game film cued up on a television when he entered the room. "He was just showing different clips, different plays, asking me what the formation was. I had never seen some of it," Francois said. "If your mouth stopped, something was coming off his tongue right quick." Teams don't want to hear rehearsed answers. And if they do get one, the player should expect a follow up asking for the real story and the real answer. "It's personal questions. Your family, how you were raised, how well you did in school, if you had any failed drug tests, run-ins with the law," said Ravens defensive end Pernell McPhee, a fifth-round pick in 2011 who was stunned to hear such questions. "They ask you every question possible, and they already know the answer. They just want to see if you're going to tell the truth." From Nate Davis's "USA TODAY Sports' 21st All-Joe team"
Returner — Leodis McKelvin (Bills): His 18.7-yard average on punt returns was the second-best since the 1970 merger, and he brought two back for TDs; he also averaged 28.3 yards on kickoffs. Kicker — Justin Tucker (Ravens): Impressive rookie connected on 91% of his field-goal tries (30-for-33) and didn't miss inside 40 yards. Among those with at least 40 kickoffs, no one whose home field didn't have a dome drove it better than Tucker (67.5-yard average). 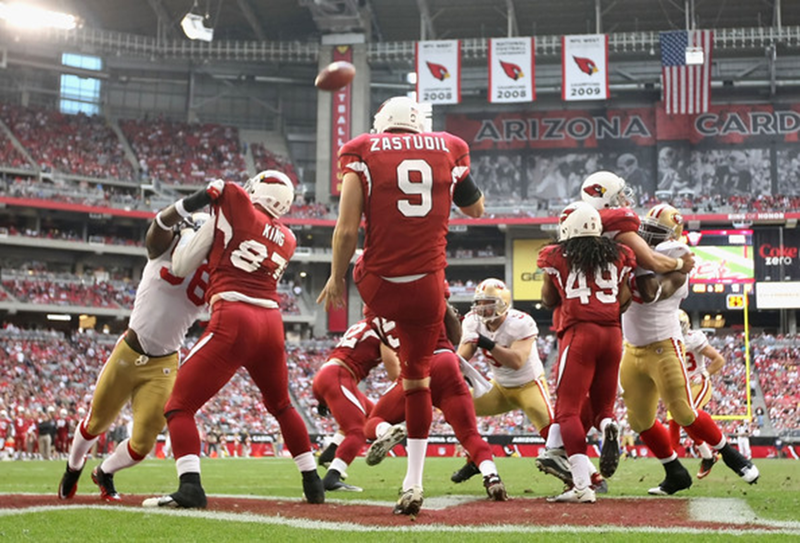 Punter — Dave Zastudil (Cardinals): Dropped 46 punts inside opponents' 20-yard line, a new NFL record. 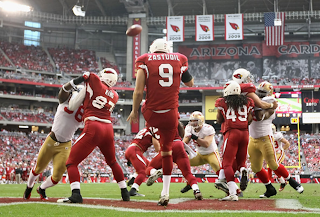 Despite the horrid field position Arizona often had, Zastudil didn't merely bomb away and instead maintained an excellent net (41.4 yards) while forcing a league-high 36 fair catches. And he did a lot of work, his 112 punts 21 more than anyone else last season. Ace — Bryan Braman (Texans): Playing as if his flowing hair was on fire, he blocked two punts, both returned for Houston TDs (one by Braman himself) and was a demon in coverage, making a team-high 16 special-teams tackles. Glenville grads playing in Super Bowl giving their all for their former coach, Ted Ginn Sr.
NEW ORLEANS -- San Francisco 49ers safety and Cleveland native Donte Whitner, who will face the Baltimore Ravens in the Super Bowl on Sunday, pointed to a tattoo on his bulging forearm during a media session Thursday that read, "Thank God for Ginn." The indelible mark on his arm -- and on his soul -- is a tribute to his former Glenville High School coach and father figure, Ted Ginn Sr., who has been battling pancreatic cancer since August and is in New Orleans to watch Whitner and his son, 49ers receiver Ted Ginn Jr., play in the biggest game of their lives. "Teddy and I would not be here today at the Super Bowl without Ted Ginn Sr.," said Whitner, the 49ers' starting strong safety. "Ever since we were kids, Ted pushed us to get to where we are right now -- from Glenville to Ohio State to now. And to have him here with us after everything that he's been through this year makes it all the more special." In late August, just before the start of the high school football season, Ginn Sr., who has transformed the lives of hundreds of inner-city kids at Glenville and Ginn Academy for underprivileged boys, was rushed to University Hospitals for emergency hernia surgery. During post-operative exams, his surgeon, Dr. Jeffrey Hardacre, discovered a tumor on Ginn's pancreas that was producing excess insulin. Ginn, 57, quietly stepped away from the Glenville sideline to begin a journey of surgeries and recovery that has left him 55 pounds lighter and more grateful than ever to be alive. Hardacre removed the tumor in mid-October, but Ginn suffered a complication that required a follow-up surgery. Subsequently, he developed fluid in his lungs and had to undergo another procedure. All told, he spent about 60 days in the hospital and was released just after Christmas. "He's been to hell and back," Hardacre said. "It's a miracle how well he's recovered from a difficult post-operative course. But fortunately, he has a very good chance of being cured of his form of pancreatic cancer. If you're going to have one, it's the kind you want to have." Ginn's voice is weak but his spirit is strong. He has spent the week in New Orleans, not far from where he was born and raised, relishing in the joy of Whitner and his son being in the Super Bowl. "There's no question, I'm a walking miracle," he said. "I'm blessed to be here. The doctors called me their miracle man. If not for God's grace, I wouldn't be here. I have good days and bad days, but I wouldn't have missed this for the world." For Ginn Jr., who mostly returns punts and kicks for the Niners, watching his dad enjoy the Super Bowl festivities has been the highlight of his week. "I watched him [Tuesday at media day]," said Ginn Jr. "Just to watch him look around, he wanted to cry, but he couldn't. It's big. No matter what goes on, I'll be happy that I gave him this opportunity to experience this. It's a dream come true for him." Ginn Jr. struggled to get through this season, knowing his dad was 2,200 miles away, fighting for his life. "I was very, very afraid of losing him," Ginn Jr. said. "It was really tough knowing I couldn't get there, couldn't be there for him every day. That was the scary part." At midseason, the 49ers gave him a couple of days off so he could fly home and be by his father's side after one of his surgeries. "That kind of gave him the push to get back on his feet," Ginn Jr. said. "Ted's visit was like a shot of medicine," Ginn Sr. said. "Certain people in your life are better for you than medicine, and that's what Ted is to me." Ginn Jr. watched his dad, a father figure to so many and a rock in the community, fight hard in the hospital, even when he had no strength. "He doesn't depend on anybody," Ginn Jr. said. "Everybody depends on him. He's so headstrong that, when they were telling [him] in [the hospital] he couldn't get up and walk, he was telling them he could. He showed us another side of himself. We had to watch him man up and toughen up. Him doing that, it made me be a better man." Ginn Jr. knew how much it tortured his dad not being on the sidelines with his Tarblooders. "I watched him miss his whole football season and my whole football season," he said. "I watched him miss football, period, from the high-school level to the pro level. He'll usually catch the Ohio State games, he'll usually catch my teams, so for us to be still standing -- and for him to be with us -- it's a blessing." Ginn Jr. has watched his father endure so much this season that he wants him to quit coaching football. "I want him to hang it up," Ginn Jr. said. "It's time. He's done everything he could possibly do. He's had 18 Division I scholarships, and he's had 22 kids go to Division 1 schools. He had at least two or three kids in the Big Ten at each school. He had at least seven, eight, nine kids in the NFL. He's done. There's nothing more for him to accomplish. "I want him to go home and chill with my twins [2-year-olds Ted III and Kyrsten]. I want him to smell the roses, walk his dogs and kick rocks." But for Ginn Sr,, whose Tarblooders are as much a ministry for saving lives as a football team, a return to the sidelines is one of the things that's been keeping him going. "I just need to get a little stronger and get my endurance back," he said. "In a month or so, I'll be back at work." Whitner, who was hit by a car at age 6 and was told he'd never walk again, will never forget how hard Ginn Sr. pushed him to get to this point. "When I wanted to go right, he wanted me to go left," Whitner said. "He started me and Ted Ginn on the same program as young kids. We had personal trainers five days a week together, protein shakes, extra weight lifting. Ted would drive us to a hill . . . and make us run up and down. We wanted to go to the school dance, and he wouldn't allow it." Ginn Sr. pushed them so hard that Whitner often told his mom, Deborah, that he wanted to quit. "Then she'd call coach, and he'd come over and sit on my couch and tell me why I shouldn't quit and motivate me to go back to the gym and work out again. He's changed so many lives that you can't put a number on it. 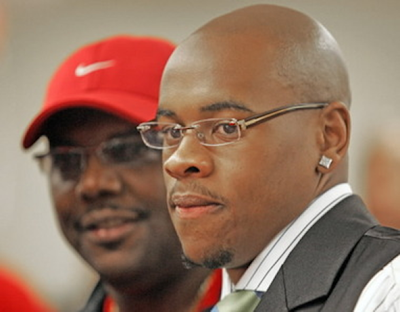 Every college coach in the country knows who Ted Ginn Sr. is and respects him." Ginn Sr., who currently doesn't have to undergo chemotherapy or further treatment for his cancer, had a method to his madness for driving his son and Whitner. "I kept them the whole day -- from 6 [o'clock] to 6," he said. "That was purposely done so they could play college football and have a chance to get to the NFL. This is the moment I expected for them and that they've trained for all of their lives." But now, Ginn Sr. said, they have to close the deal and the win the game. "If Ted and Donte win the Super Bowl, a lot of people in our community would benefit from it," he said. "It would mean everything. Think of how many more lives could be saved because so many kids look up to them. I want to make sure that the kids walking the streets of Cleveland are be inspired by Ted and Donte and know they can achieve their goals, too." Someday, Ginn Jr. would like to return to Cleveland and coach football, although maybe not at Glenville, where the shoes to fill are enormous. He'd also like to carry on his dad's legacy and keep Ginn Academy going strong. But for now, Ginn Jr. and Whitner on are on a mission to win this game for Ginn Sr.
Ginn Jr. has vowed to play his heart out for his dad, and Whitner has dedicated the game to him. "If we win this game," Ginn Jr. said, "I'll give my Super Bowl ring straight to him." Labels: donte whitner, NC Sports Athletes in the News, ted ginn jr., ted ginn sr.